So, Matsuura Aya recently released her 7th album, click you link me. Matsuura has been veering towards a more mature style for a while now and this album enters new territory with a sort of psuedo-jazz feel. I’m not sure how I feel about this, I’m not a huge fan of jazz but I do like Matsuura, so I’ll now give a track by track review. Interlude ~Okay~ – So weird. Not really reviewable, lasts only 33 seconds, thankfully. Some Oricon Ranking data is available for the album, over it’s first three days it charted at 37 and 47 on two days only. After a brief hiatus, Matsuura Aya will release her 7th album this November, on the same day as both Goto Maki and Mano Erina’s new albums. I’m not sure, I think Haruna preferred bubblegum Ayaya. I like her recent( a year or 2) releases. Mature and very smooth. She also an amazing singer with an amazing voice. I’ll definitely check this out. Morning Musume’s latest single Naichau Kamo has ranked at #3 in the Weekly Oricon charts with sales of 44,121 – better than their last 4,000 below Resonant Blue. Not bad at all – it’s nice to still see Morning Musume charting high! They were only around 2,000 copies behind the #2, Acid Black Cherry. Sales weren’t so favourable for soloist Matsuura Aya who managed to sell only 757 copies of her single in the second week bringing her to a total of 4,795 so far. Pretty poor for the once mega-idol Matsuura. The ravex / BoA / Goto Maki colloboration single charted at #8 with sales of 15,074 – I expected this to do a bit better as all the tracks on the single are amazing! It quite possibly has more long lasting selling power than Naichau Kamo though. Good job Morning Musume, but I feel sad for Ayaya, her single did so bad. The soon to be axed Elder Club are getting releases thick and fast with the release of Matsuura Aya’s 21st single titled Chocolate Tamashii to be released on 2009-02-11 announced today. This release has been speculated at for a while as the Single V was revealed around a week ago – I didn’t want to post anything though until I had some concrete proof of the single’s existence (Thanks e-hon!). 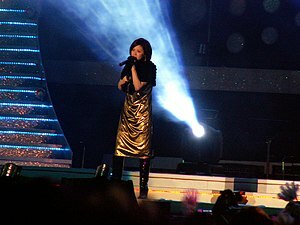 The Single-V will be released two weeks after the single on 2009-02-25. Ayaya has gotten a few endorsements recently with a few more CMs to help promote her. Promosingly the single has been described as an “upbeat valentine melody.” I’m hoping for another Ki ga Tsukeba Anata type song! Matsuura Aya has had a new profile picture uploaded on the Hello! Project Official Website and I personally think she looks really classy and pretty! The covers for her new album and last as a Hello! Project soloist are pretty awesome – there’s ony one edition of the single and one cover shown is the inner album cover and the other the slip case. This is a step up from her last album, Double Rainbow, which had the same cover both for main album and slip case. The timing of this is curious given that Ayaya is supposed to “graduate” as part of the Elder Club in early 2009. Lots of interesting new releases have been announced today, all of which will be released in January / February 2009! I’ll list them in order of release and you’ll also find them on the release-schedule page. Who could have forseen this one? Most likely Matsuura’s final release with Hello! Project. Looking forward to this though I found Double Rainbow (her last album) a little boring. Woah! More releases? This could be interesting, especially that the girls are getting a little older now. I’ll try not to judge too soon. The title means “I might cry,” sounds pretty promosing to me and I hope it’s similiar in sound to some of their more recently popular singles; Onna ni Sachi Are and Resonant Blue to name two. Wow! xD I’m really excited for all of it. Apparently one is possibly in the works. I heard that Tsunku talked about it on his blog…he had mentioned the C-ute album, a new single for Momusu and a new album for them as well. I’m also quite excited for the Aya release since that completely surprised me. I also read that for now Buono’s next single was Koi no Love Potion and their album was (for now) to be called Al Buono or something…found out anything about that yet? @Max: Thanks for clearing up the album and the single issue. What a pity about the title, it sounded like it would’ve been very catchy.